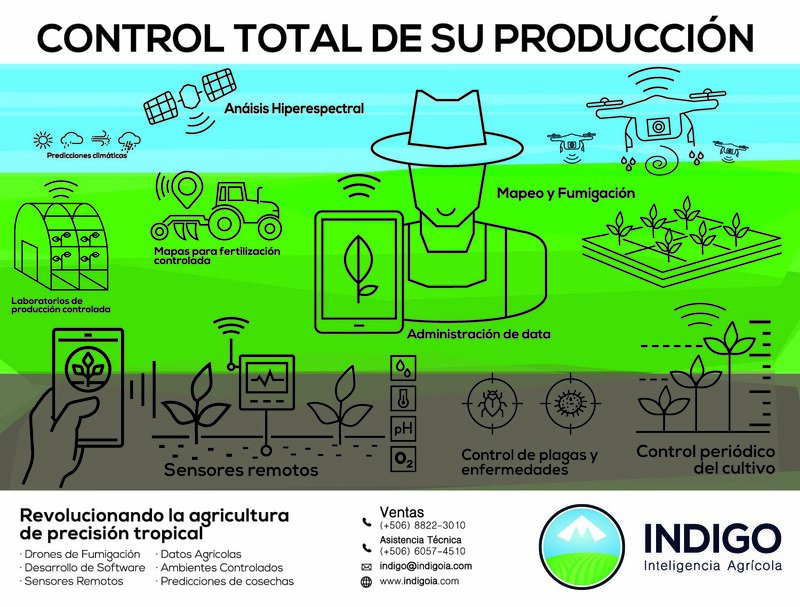 Sergio Ballester, an Alumni of the Costa Rica Founder Institute, is the Founder of Indigo Drones, a precision agriculture and data intelligence company. Ballester has already accomplished a lot in his short career, working as a general manager for his family’s business while simultaneously attending the Grenoble Graduate School of Business from 2006 to 2011. By 2020, The tropics will be growing 75% of the world's food supply. This is a demand Central and South American farmers need help to meet. At present, they don’t even meet their average yield predictions. Agriculture today faces a multitude of enormous challenges. A growing global population and rising international affluence means there is an increasing demand for meat products, which have much higher costs in terms of energy and commodity inputs versus plant-based diets ranking lower on the trophic chain. Conventional agricultural production methods can also perversely incentivize farmers to overuse chemical fertilizers and pesticides, leading to nutrient runoff eutrophication and other nonpoint source environmental contamination. The world also is running out of bioavailable phosphorus, one of the three critical plant macronutrients. Then there’s the slash-and-burn clearcutting for grazing land, and spreading desertification caused by a warming climate, as well as a steady depletion of freshwater aquifers. With so many different challenges, the solutions for creating a more sustainable future agricultural system will be many and varied. Indigo Drones is an agricultural intelligence company that uses UAV technology (unmanned aerial vehicles), as well as other types of IoT sensor devices, to create intuitive ‘smart maps’ that allow farmers to make data-driven decisions in the field. Precision agriculture means leveraging technology to more closely monitor what is happening in a given field, so that preventative actions or remediations can be taken quickly and accurately, saving on costs while boosting yields. For Indigo Drones, using aerial mapping and crop monitoring means that farmers can precisely identify where problems arise before they have time to spread, so that farms can more closely control what crops receive which inputs and at what dosage/quantity, from water to pesticides. This kind of actionable data results in improved yields, while simultaneously delivering farmers tangible savings in reduced fertilization and overirrigation, lowering overall costs and resulting in higher margins when crops are harvested and sold. Since launching the company in 2014, Indigo Drones has successfully taken flight and soared to new markets: both geographically and within their industry vertical. Today, the business has opened up a second office in Panama, as well as expanded the scope of agricultural data services that it offers to its customers. The data needed for the analysis is pulled from images taken by drones, foliar samples, soil samples and sensors in the field. For optimal results, images should be taken regularly. The field data relating to areas with the variables to analyze are processed into a complete map. The IndigoIA software performs statistical correlations of the field data and the areas to be analyzed, using the results to create alert maps through artificial intelligence algorithms. Alert maps allow, in real time, to make more timely and accurate decisions. The results are classified according to a scale previously established to facilitate interpretation. The decision on whether and how to amend the conditions or otherwise address any problems identified by Indigo drones ultimately rests with the customer. Indigo offers the ability to send spraying drones to target pesticide applications to specific places with a high degree of accuracy. This information is aggregated over time, allowing for comparison between similar crop and environmental use cases, as well as applied in predicting how the next crop cycle will behave. Using predetermined parameters, data collected from UAVs and other IoT device sensor inputs are plotted in space to create heat-mapped visualization tools, for each plotted tract of cropland, and for each of the parameter being measured (such as foliage color, or soil moisture levels, for example). These real-time Alert Maps allow Indigo customers to quickly visually understand what what is happening across each of their fields, and to take corrective actions with confidence and precision. Indigo Drones has formed several key partnerships, including with the University of Costa Rica, BioQuim, MIT, Precisionhawk, as well an exclusive partnership with drone manufacturer DJI. In recent years, the company has run government projects with the Ministry of Agriculture in Ecuador as well as in Costa Rica, and closed numerous large scale project deals with private agricultural companies. It is impossible to beat someone that never gives up.